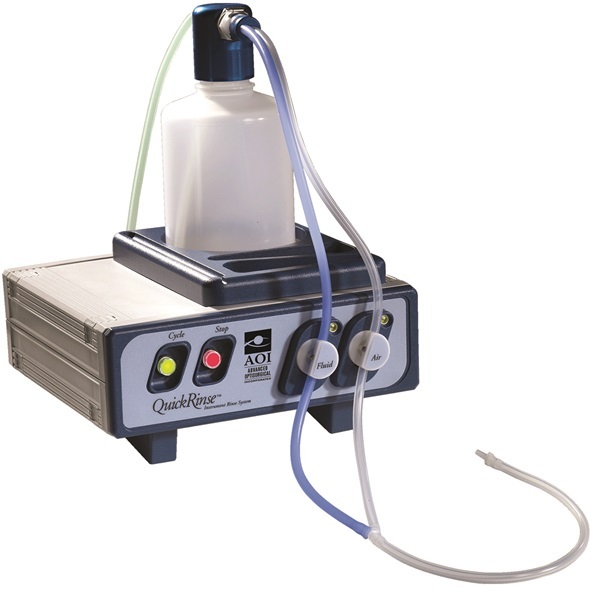 The QuickRinse instrument rinse system uses pressurized water and air to rinse lumened instruments and tubing, such as phaco handpieces, vitrectomy cutters, and I/A tubing. Unlike with a syringe, the compact system provides consistent rinsing pressure regardless of the operator. The QuickRinse also eliminates hand fatigue associated with repetitive syringe use. Complete system comes with: operator’s manual, console, complete bottle assembly, nose cone rinse attachment, dual rinse “Y” attachment, power cord, power supply, accessory fittings, nylon brush, spare bottle cap gaskets, and spare quick-disconnect O-rings.